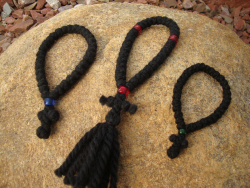 These traditional, pure wool prayer ropes are carefully hand-made by the Sisters, using 2-ply, 3-ply, 4-ply, and now double 4-ply yarn. The ply determines the thickness of the yarn. 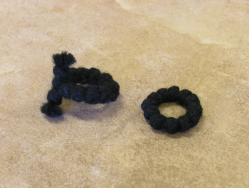 The 2-ply yarn makes the smallest knots and shortens the overall length while the double 4-ply has the largest knots and the longest overall length. 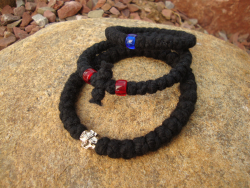 Available colors vary for each of the plys and are shown on the product pages below. 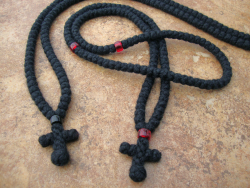 3-ply "Athos" wool is available only in traditional black. 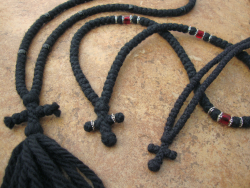 The prayer rope may be gently stretched to separate the knots. 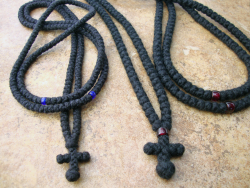 Each variety of wool prayer rope comes in three styles: Russian--on which there is a bead after every 10 knots and a tassel below the cross, Greek--which has a bead after every 25 knots and no tassel, and Greek with accents--which is adorned with additional metallic accent beads. 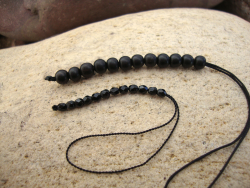 Photographs of the different styles are shown on each product page. 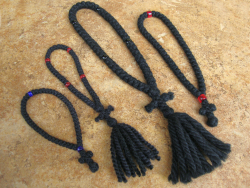 Please note the amount of time we need to make the prayer rope before we are able to ship.